I just started building a new pond. This is my first pond and I would ask for your help. I would like to hole pond be powered by airlift sistem. He pond is't finished yet and next week i continuinf to digg filter hole ( 260 cm x 274 cm , depth 100 cm ) In the extension of the pond. Dimension of the pond is : 255 cm x 390 cm, depth 180 cm and dimension of airlift chamber is 150 cm x 118 cm, depth 180 cm. It this chamber will be position airlift pipe which is conecting with filter pit and pond. On the bottom of pond would be 2 x 110 bottom drain and on the wall there will be one wall skimmer. In the filter pit i will use this 3 or 4 containers ( https://www.nikoi.nl/aqua-silver-connec ... erlysansai" onclick="window.open(this.href);return false; ) and UV. Which is the lowest level of water intake from last filter chamber to airlift and which is the lowest level where return pipe from airlift entrance to the pond in my case? What do you think about this design in general and would you change anything ? What do you suggest for filter material ( japanise matt,koi brush, helix,...) ? What do you think about this kind of sieve filter - https://www.nikoi.nl/aquaforte-compacts ... lter-green" onclick="window.open(this.href);return false; and where is it connecting? Your plans look good for the most part. Two bottom drains plus the skimmer should be good to run an Airlift. Could you rephrase this question, as I'm not exactly sure what you mean? Bartol wrote: Which is the lowest level of water intake from last filter chamber to airlift and which is the lowest level where return pipe from airlift entrance to the pond in my case? About your design, you already summed up most of the important elements. You just need to make sure that everything will be compatible as I said above. For your filter, a good way to go would be using either a Crielsieve or brushes as your first mechanical filtration. Then perhaps a moving bed and japanese matting. This is what I'm considering for my own project as well. The sieve you linked is impossible to use in an Airlift powered filter. As the site mentions it is pump fed and it has to be placed above water level. This means you would have to use either brushes or a Crielsieve setup. By the way, I can't clearly see if you already have openings in the pond wall. But keep in mind that you will need a hole in your wall for the Airlift return, and the skimmer needs to be built into the wall. Also, the bottom drains need to be placed level with the pond floor, and the connecting pipes should run under your pond floor and come up in your filter area. If you already have a concrete floor without the bottom drains placed you will be in trouble. You have some pretty good questions, the things you are asking about are way beyond what most people look into for their first pond. Yes, you're right, these containers come without openings for transits. How many holes 110 do I have to drill for transit two or one between containers? Thanks for the suggestion for immersion UVC ! Which is the best position to accommodate me in my case ? I'll try to clarify what I was thinking about the heights. On which high the water must enter from last continer to the collection pipe? Which is the lowest point in relation to the surface of pond where water comes from airlift to pond ? Can you recommend me some Crielsieve which i put in first container ? Yes,you have noticed well, all holes and positions for skimmer and bottom drain I'll do it later when I'm 100% sure of the whole project. What do you think about space for the equipment in the filter (260 x 275 x 100 cm deep ) will be big enough or i must expand it ? To be absolutely safe, two 110mm transits should suffice. You could also use one 125mm transit. These UV units are pretty versatile, you can place them in your filter, or in the collector next to the Airlift. Anywhere where high flow passes through your system. I would advise to pick a spot at the end of the filter, or inside the Collector, as most of the particles have been filtered from your water at this point, making the UV a bit more efficient and less dirty (requires less cleaning). The height of the connection to the Collector does not really matter, it depends on how your filter is situated and if you use up-flow or down-flow. The lowest point to return your water can be manipulated, but normally we advise to return about 5cm below water level. Why would you want to return lower? I will get back to you about the sieve. Good to read that you thought about the positions of the drain and skimmer beforehand. Your filter space sounds pretty large to me, what do you want to keep in the pond? Now I'm thinking of leaving these containers and making a watertight filter with partition walls. so I will reduce the dimensions. Please, when you take the time to write me something about the sieve and where it can be positioned im my case. Making your filter area watertight is a good idea, but keep in mind that normally you would coat these filter bays with fibreglass and a sealant on top of that. If you have no experience with this it's best to hire someone to do it for you. No need to reduce the dimensions, it's good to have a big filter so you have a bit more capacity than you may need. You can always leave a chamber empty for now. I'll be working on the topics by Smetjen and Koi.Gin, they both built filter bays that were sealed with fibreglass. That will be up soon, keep an eye on those topics. I'll send you a PM about sourcing the sieve(s). I'm waiting for your PM about Siev and for new topics about DIY filter bays. After answering some questions through PM, I'm continuing the topic here, so others can benefit as well! What do you think about this design : ( https://www.koivrienden.com/phpBB/viewt ... 40#p286840" onclick="window.open(this.href);return false;) ? The subject is in Dutch, I can only understand something from the picture...I think the dimension is similar to mine, but I will have two bottom drains. For which those valves in the first chamber (the middle valves on the T-pieces) ? How such type of filter is cleaned ? The sewer pipe on me is higher than the bottom of the my filter. What is the recommendation for the filter material in this topic on koivrienden ? This guy has some very nice drawings indeed. I think it is well thought out for the most part. The members there have some comments on the design, I will tell you more about that in a second. He also has this very specialised idea for a plant filter that can be moved, but I don't think you want to use that idea? The guys on the forum are saying it's a bad idea anyway. Other than the plant filter it's a very solid concept drawing. His idea is to use one bottom drain, one side drain and one skimmer. He says the filter will be 4 chambers, the first chamber has the Crielsieve as you can see, the other 3 chambers would be filled with Japanese matting. The other members advise him to add another bottom drain, and to make the pond bigger. He wanted to use 75mm pipe on his skimmer line to limit the flow through the skimmer, but they advise against this and say to use 110mm. Another thing they say, is to remove the dividing walls he uses all over the filter. The one next to the Crielsieve is not going to help, and the other dividing walls in the rest of the chambers will just limit flow. Also, 3 chambers full of Japanese matting will limit flow too much as well. According to them it's better to start with the Crielsieve chamber, make the second chamber a static bed filter to filter out even finer particles (optional), third chamber should be a moving bed filter and the last chamber could then be filled with Japanese matting. I agree with this by the way, this is very similar to what I'm going to use myself. You asked about the middle valves on the T-pieces in the first chamber. To be honest I was not sure about these myself. I think these are used to clean the bottom drains and pipes. This way you can keep the filters undisturbed, and keep the normal water level in the filter (by adding a bit of pipe at the top of the inlets in the first chamber). I am not 100% sure, but I think this is the reason. personally I would not bother to build this as I think you can just clean the bottom drains by closing them at the first chamber, emptying the first chamber, and then letting it fill back up when you open the bottom drains again. So I think this is just a very neat way of doing it without having to empty the first filter chamber. But considering the cost of these valves, I would not use this. An important tip from me though: If you look at that drawing you can see that each filter chamber has its own drain with a pipe going all the way to the start of the filter, where they each have their own gate valve. Doing it like this is a bad idea. As you can see these valves are the only thing that close off the filter drains. If they start leaking, they immediately leak into the filter pit, and the pond will lose water. At this point in the filter, the best way to do this would be to use another ball valve after these four gate valves. Gate valves are much cheaper to buy than ball valves. But the problem is that they WILL leak after some time. When you're just closing between the pond and the filter, this is no problem as the leak is always small. But in this scenario it will slowly empty the pond if you're unlucky. Adding another ball valve after these gate valves is a good way to ensure that it won't leak. What I mean by that is, you should connect these four drains to one pipe, and place the ball valve on that pipe. If your sewer is higher than the bottom of your filter, then you should not connect to it, you won't be able to empty the filter in that case. I'm thinking about this as well. Normally you would have a filter pit (like the one in the topic) where you can empty your filter. In this pit you place a pump that can handle the dirty filter water and pump it out. Connecting directly to your sewer is ideal but not always possible. Wow !! You helped me a lot with this answer and now is much more clear to me !! About dividing walls you suggest that i only build one concrete dividing walls between chambers ? Static bed filter is chamber fill with for example helix without moving air - Is that correct ? Can i use this for connect each chamber to the drain pipe - http://www.koi-spirit.de/pvc-fittinge-z ... m/a-10109/" onclick="window.open(this.href);return false; and than on the end of main drain pipe i use one 110 ball valve? And last question is can i use normal 110 mm sewer pipe for all connecting in pond and filter or i must use some kind of special pipes and can i glue all PVC pipe and fitings with ragular Henkel Tangit glue? Of course, You can switch this conversation into the topic, I hope this might be of help to other beginners. You could maybe modify that skimmer in a similar way as Gino did. He had a skimmer with a 160mm opening (outside diameter) which had to become 110mm (inside). In your case, the opening is much too small. But looking at it it seems like the skimmer could also be 160mm (outside diameter) before it has the small outlet. If it is 160mm, maybe you could just use a saw and take the end off. After that do the same thing that Gino did in the topic above and you will have a 110mm skimmer. I think it is common to have to alter these skimmers, depending on which ones you order. I would not use the extra dividing walls that you see in those drawings. I have an idea for the filter bays, which I will also use. Marc gave me this idea, I will make a drawing of it later as it's a very nice design. Yes, a static bed is pretty much just like a moving bed filter but without the Air supply to rotate and aerate the media. The difference in function is that a static bed will also function as a fine filter. I don't think it's necessary when using a Crielsieve, as the particles that can move through are really tiny. It's more of an extra measure, depending on how clear you want your water to be as well of course. If you build your chambers out of concrete blocks, you normally build the drain into the floor or wall of the chamber. The part you're showing is a transit used on liners or plastic containers. If you build your chambers out of concrete you will not need these. I'm no expert on concrete filter bays though. So if you want to know what the best way to build the drains is, I will have to check with Marc. You can connect your drains all to one pipe with a ball valve at the end. This doesn't have to be 110mm. I think this will be overkill and ball valves become much more expensive as you go bigger. I think 75mm should be more than enough. I have 50mm drains on my current filter and those are 250L barrels I think. Personally I would still give each chamber a gate valve so you can drain them individually. The type of PVC used is a heavily debated topic. If you want to be absolutely safe, use pressure PVC pipe from the bottom drain until your filter connection. Since this piping is under your pond with the most weight above it. Also, if that piping breaks, cracks and leaks, you will not be able to easily get to it and repair it. For everything else I would personally just use normal PVC. Be very careful and make sure all your pipes fit the socks, bends and valves you will use. Any glue made to glue PVC should be fine (any of the known brands for sure). It would be good to see it Marc design for the filter bays. Finally my project continues. I need help with the filter pit. The main pond is almost over.I need to make pond floor, bottom drains, opening for transit and watertight all walls. I need some ideas for filter pit designe.The filter pit will be constructed of concrete blocks. I gave up from a wall skimmer and goes with surface skimmer. How to make entrance ( from skimmer and bottom drains ) to first chamber of filterpit ? On which high i put valve on this entrance pipes? Can you sugest dimension on each chamber. First chamber would be DIY Crielsieve. How many chambers do i need ? i think to go with 3 or 4 chambers. How to buld transit from eache chamber ? What material do you suggest for buld dividing walls ? Also I want all the sockets and electrical parts to have in the filter pit in some kind of dry area. Which would be the simplest way to clear the cleaning and drainage of dirty water from each chamber in my solution. Unfortunately I can not connect the filter with the sewer. Is there any solution for automatic top-off for evaporated water? The depth of the pond is 180 cm, whether the filter depth should be the same ? Below I'm sending the picture. In the pictures you will notice the part intended for airlift, but I think it is not well done and the part where the water will enter i must knock down. What you suggest to do with that chamber, to be functional ? Sorry! I missed your new post. I read through it and will give a proper reply later today. No problem Pssymon, when you have time! Hey Bartol, sorry for my late reply. I don't have much time today and your questions are quite complicated. I think I have to get back to them a second time and perhaps ask Marc about some details as well. For now I will answer what I can. Why did you give up on that? Can't you use the opening in the wall seen in your photo to fit the skimmer? If you use a floating surface skimmer you cannot connect to your filter as far as I know. These simply collect floating debris in a small basket that you have to empty from time to time. For the bottom drains, you are using two right? I would place them in the middle of the pond floor, at equal distance from eachother and the pond walls (I'll make some quick drawings later so you see what I mean). Placing bottom drains is a very precise job so please do not rush this. You need to glue a 90 degree pressure PVC bend to both drains, and glue a piece of pressure PVC pipe into them. The length depends on how much room you have to work with. You need add the pipes at this stage so you can make sure the drains and the connecting pipes are absolutely level. Slightly dig the drain and pipe into the ground as you see fit, and level them using the soil or some pieces of brick. Keep in mind that the height your drains sit at now will determine the height of the pond floor. Later you will have to fill the pond with concrete up to this level! When they are in the correct position, mix some concrete and pour it around the drain and elbow (below the opening of the drain!). After this your drains will be completely fixed in their final position. 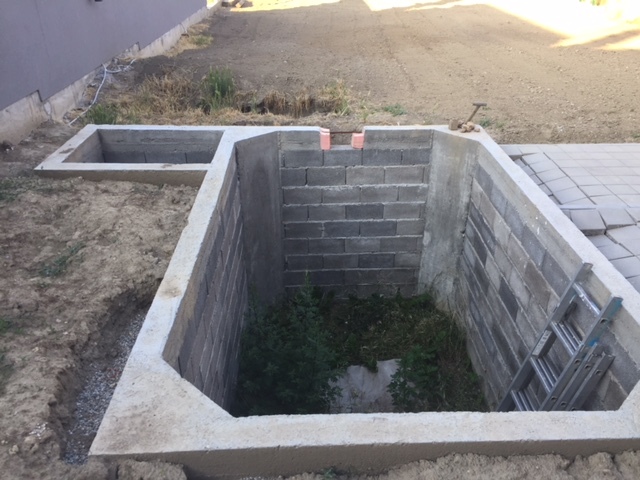 Next, you will have to extend the pipes coming from the drains to go under (if possible) or through your pond wall so you can connect them to the first filter chamber on the other side. I would keep in mind where you want to enter your first filter bay when building it. I would put them next to eachother, with some room in between, near the bottom of the first chamber. Just build the wall of the chamber around the pipes and seal around the pipes using cement. Where the pipes enter in the first chamber, keep some length of pipe so you have a bit of distance from the wall. Cut these pipes at the same length and add two 90 degree elbow pieces again, this time pointing upward. Once you are inside the filter you can use normal PVC instead of pressure PVC, since you can always replace these pipes in an emergency. By now your bottom drains are done. You can add valves to both of them on any height which works best for you, above the elbow piece in the filter chamber. I would use two gate valves as they are cheaper and the risk of a small leak is not important when closing off a bottom drain like this. After this you can finish the pond floor. The best way to do this is by placing some plastic sheet material on the floor after it's level. Then place some rebar mesh covering most of the pond floor. Raise the mesh up from the ground slightly by using bricks or other pieces of stone. Place them around your drains, cut spaces into the rebar if neccessary. After this you can pour concrete up to the level of your bottom drains (be very careful that you don't overfill). Your floor should be around 10cm thick, opinions on this vary, I will check with Marc to be sure. I have some ideas on the size of the chambers, I will get back to you on that with some drawings. I think chambers of 80 x 80cm or so could work, but you have to be careful and take the thickness of the brick walls into account as well. At that size you could build 3 chambers, but 4 might be better if you make the filter area slightly longer. The chambers should NOT be as deep as the pond, as that will give you a lot of trouble maintaining and cleaning them. A depth of 1 meter is more than enough. As for the transits and dividing walls, I would stick to the same materials. Build the filter area out of concrete blocks, and build the chambers within using these blocks as well. The transits between the chambers can simply be pieces of PVC pipe in the desired diameter. Simply take pieces of pipe that are +- 10cm longer than the thickness of your walls, cement these into the wall so you have 5 centimeters of pipe sticking out on both sides and you have your transit. I will get back to you with some drawings on how to build these transits exactly, and the placement of them. Valves will not be neccessary. After you've built all of this, the only thing you need to do is finish the surfaces with plaster, and after that, fibreglass. About your Airlift chamber. It looks fine, you just need to connect your last filter chamber to this chamber, the height does not matter as long as it is under water level. Use the same technique that I discribed above, put a piece of pipe through the wall. Since this is the inlet for the Airlift chamber, you should use a larger diameter. 125mm or 160mm if you want. For the Airlift in the chamber, you will have to drill through the Airlift chamber / pond wall or break it where you need to go through. Put a 110mm pipe in the wall and seal around it with cement. Leave 5 centimeters on both sides. Later when you finish the pond you can render and fibreglass this chamber as well. When you have your Airlift ready, connect one or two 110mm T-pieces to it so air and protein can escape, then attach it to the pipe that goes through your wall (5 centimeters below water level is ideal) and you are done! In your current drawing I see some room for that, I will make a drawing. I think I have talked about a good way to do it on the forum before. I will look it up or make a new drawing. There are solutions for automatic top-off, should be very easy but I don't have experience with it. I will ask Marc. I talked about this, some of it will have to be drilled or knocked down sadly. Please post when you have some new information from Marc and drawings. First chamber is reserved for your criel sieve, dimension to also be 80 x 80 ? I started working on some images and kept adding details and figuring things out. These should now answer most of your questions. I made everything to scale in Paint, 1 pixel is equal to 1 centimeter in real life. Since I made a number of different drawings and had to change the design a bit, I decided to upload my earlier basic drawings as well so you can more easily understand the process. The final images are quite complicated. So, earlier you gave me your pond dimensions, along with the Collector chamber and your planned area for the filter. You told me in a PM that your walls are 15 centimeters thick. We talked about building filter chambers with a dimension of 80 x 80 centimeters, I think this is a very good size and I designed your filter with this in mind. As you can see, this area cannot even fit two filter bays at 80 x 80cm. This is close, but this design is still 10 centimeters short if you want to fit four filter bays. 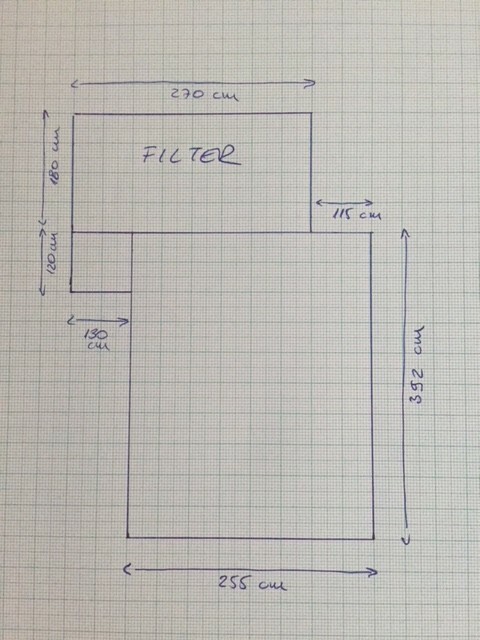 - Build the filter area like this and make the first filter bay 70cm wide instead of 80cm. - Extend the filter by 10cm, making it stick out a little from the shape of the main pond. For the next drawings I simply extended the filter area by 10 centimeters. It does not really matter which option you would choose as you could build everything in the same way. Next, I started adding details. As you can see I added another filter bay on the left side between the last filter bay and the Collector chamber. Alternatively, you could place a 125mm transit to cross this area, as it's the last transit into your Collector chamber. This would be a bad use of the space in my opinion, so I figured an extra chamber would be a better solution for this leftover area. Now the drawings are taking shape, I think I explained most of the details in the drawings already so please take a good look at them and feel free to ask me about anything. Use smaller drains for the filter bays. 75mm should be fine. Connect the drains to the main pipe that is placed on the side of the wall just underneath your filter bays. Glue a T-piece to this pipe, right above your filter pit and add your 75mm ball valve at this point. We use this technique because knife valves can leak over time, but they are much cheaper compared to ball valves. Instead of giving each bay a ball valve, we use one ball valve at the end to make sure that the pond can never leak. Here you can see how the overflowing transit system works. Marc has also used this in his pond and I plan to use this as well! These depth numbers are important. The Airlift needs at least 190cm of depth to function. Your dry area in the filter is made lower to make room for the filterbay drains. In the dry area you need a filter pit. The filterbay drains lead into this pit. Inside this pit you need to place a waste water pump or a pond pump that can handle mud and heavily polluted water. When you drain your filter you can then turn on this pump to get rid of your waste water. If you can make this filter pit even deeper than the drawing suggests, that would be ideal. As you can see, the dry area has plenty of room to move around and plenty of wall space to safely secure your electric equipment. I spoke to Marc about your pond and he confirmed that 10 centimeters is a good thickness for your pond floor. He gave the same advice on rebar placement so you can simply follow my instructions. The only thing I am currently not 100% sure on, is the placement height of the big transit for your Crielsieve. I will get back to you on that, Marc knows but he did not get back to me yet. I will ask him again.